Lunar New Year Thematic Lantern Display - Happily the Fishes Leap! The word ‘fish’ is pronounced ‘yu’ in Chinese, which sounds like prosperity. See lantern displays featuring fish leaping over beautiful Victoria Harbour, wishing visitors a plentiful year ahead. 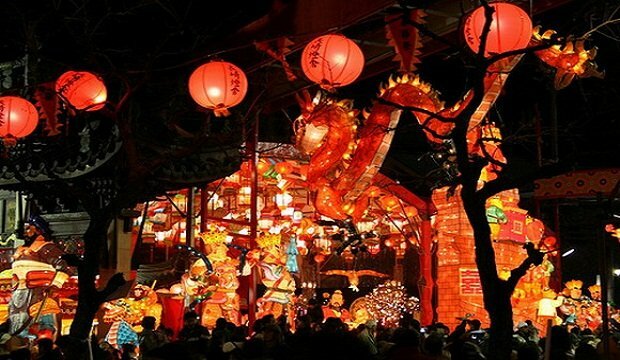 With a longstanding history, the Lantern Festival is an important festival of China, and the lantern carnival is one of the most celebrated events of the year. To celebrate the festival, the Entertainment Office annually organises Lunar New Year Lantern Carnivals in various districts of Hong Kong Island, Kowloon and the New Territories. The carnivals feature spectacular lantern displays as well as performances of folk songs and dances as well as traditional stage arts. Members of the public can act like the literati of bygone days, taking part in lantern riddle games and other game stall activities to enjoy the festive season. During the Lunar New Year, lanterns are hung up high everywhere. In past years, Leisure and Cultural Services Department have organised lantern displays at the Hong Kong Cultural Centre Piazza or the West Kowloon Waterfront Promenade, filling the first month of the Chinese lunar calendar with festivities, and allowing tourists to appreciate the pride in our traditional arts and crafts.